Finally, there’s more research suggesting the need to reduce the over-medicating of mental illness, specifically depression. The study conducted by Irving Kirsch of the University of Hull discovered that the benefits of anti-depressants, such as fluoxetine (Prozac), venlafaxine (Effexor), nefazodone (Serzone), and paroxetine (Seroxat / Paxil), are dependent upon the severity of the mental illness. It comes as no surprise that only a small group of participants actually benefited from their medications, and these patients tended to be those who suffered from severe depression to begin with. The severely depressed reaped fewer benefits from the placebo and more benefits from the actual medication than those less depressed. This not only suggests that anti-depressants serve their purpose for those who are really suffering, but it clearly demonstrates that not everyone needs to be medicated to function. Over-medicating is a serious problem within our society because it does seem easier to slap on a Band-Aid as opposed to working through months or even years of therapy. Unfortunately, the social and monetary cost of clinical therapy does not seem plausible for everyone in our society, however it hardly seems ethical or even productive to convert the depressed into addicts. In my opinion, medication should always be the last resort when alternative measures are more proficient in treating mental illness. 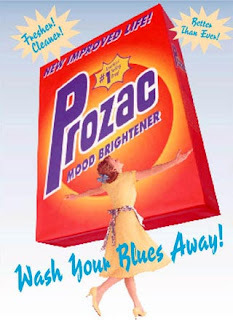 I like the prozac picture. Kind of black humor that I appreciate. Yeah, I thought it characterized the mainstream view nicely. Great post. Way too many people are taking meds that they really do not need and too many doctors hand them out like candy. That's a perfect way to describe it. It's sad, but true. It disgusts me to know that so many people out there are taking all sorts of meds, even children, and have never been given an opportunity to explore other alternatives. I don't think medication is completely harmful, but it's definitely abused. While there are those who readily opt to be medicated rather than attempt the tedious work of therapy, antidepressants are not addictive, and are certainly less problematic or destrutive to families than the many alternatives that people choose to self-medicate. I would not push medications, but I wouldn't avoid them. Research shows that there is a serious rise in suicides when depression goes untreated. I agree that it's not easy to use alternative measures and I expressed that, but they're not usually explored. Often, the solution is to quickly medicate and it ends there. The doctors rarely even have time to go through a history with you because of shortages here in Canada. The point I'm making is that there are too many people taking medications that aren't needed. The study demonstrates this. And, anti-depressants are addictive. They may not create the physical withdrawal symptoms that tranquilizers like benzodiazepines can create, however the very fact that people rely on the drug to produce a desired human experience illustrates an addiction. Thanks for your comment, j.
Caffeine, nicotine, alchohol...just a few of the drugs people take daily to produce a "desired human experience". What troubles me most, is the stigma attached to treating mental illness period. An annoying rash gets prompter medical attention compared to depression. Medications are but one tool among many. However, for some medical professionals the old adage applies "when all you have is a hammer, everything looks like a nail". What's needed is NOT a disincentive to seek help with mental illness, i.e. medication is bad....but a bigger window to let people in. There exists an untold burden of mental illness that is not even remotely close to being realized. you nailed it, kerry...pun intended. I would definitely advise to consult your doctor to help wean you off this medication. I suppose meditation could be a great idea especially for anxiety or stress. Thanks for your comment! This makes perfect sense. I believe the problem starts with the MYTH that equates taking a pill and feeling better. There may be a placebo effect, but the real effects of these medications can be measured over time. People who are not "That" depressed, think the pill will make them feel better instantly, and if it is a placebo effect, when it wears off, they are in the same place they were to begin with. People who seriousl need this medication, such as my self, noticed improvement after an extended pierod of time using the medications, and it they ain't "HAPPY PILLS", the relief is the ability to feel better and think better while continuing to work on your issues, or otherwise, know yourself better through therapy with a trained professional, and to learn all you can about human psychology, and what MOTIVATES YOU, rather than focusing on the world, situations, and other people. Well said. The combo of medication and therapy is definitely a great form of treatment. I don't think that meds alone are always a good solution, but as you said they are often good to help deal with issues during therapy. Great comment, thanks!